Five hundred Floridians will be invited to depict 500 native wildflowers – the same ones that grew in our state when Juan Ponce de Leon landed in 1513 and named it “La Florida”–from “flor,” the Spanish word for flower. 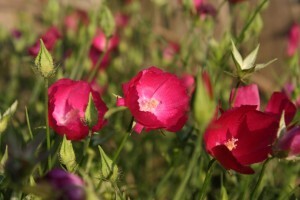 A team of scientists is selecting the 500 flowers. The artwork, along with information about each flower, will be posted on the project website (www.FLOR500.com). I decided to illustrate the flower Woodland Poppy Mallow, or Callirhoe papaver, a colorful Florida-native flower. I got inspired by watercolor paintings of flower fields. This technique offers a opaque, rather smudged depiction of an otherwise organic and even shiny surface of flower petals and stems. With that in mind, I developed a series of watercolor textures based on the color palette of the flower, and then, I illustrated the flower using geometric forms encasing sections of those watercolor textures. I then used these flower depictions to create a pattern. Final pattern piece (12×12 in) and detail of flower. The participating artists and their flower pieces will be available online for the public soon. To know more about this state-wide art project, click here.